Kick off 2019 at Crystal Mountain, with something fun for every age! 5 – 11pm: Finish 2018 surrounded by the ones you love and some great eats! Join us in the Thistle Pub & Grille for some delicious prix fixe dinner choices. Stay tuned for reservation information. 5 – 11pm: Grab your family, friends, and celebrate the end of another fantastic year at the Wild Tomato Buffet. Celebrate the New Year with your family! Join us for a buffet dinner from 6 – 8pm with the Family Fun beginning at 7pm. 7 – 9pm: Family Fun including face painting, crafts and games. 8pm – Midnight: Family DJ Dance Party. Party, 8pm – 1am: $79 per couple. Ring in 2019 with live music, tasty eats and plenty of fun. Held in Northwest Territories at the Crystal Center. Cocktails & Dancing, 10pm – 1am: $15 cover charge for dance party only. 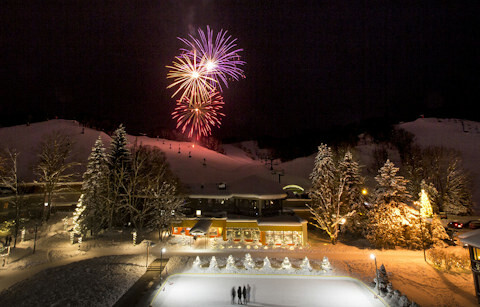 Midnight: Complimentary Champagne Toast and Fireworks! Reservations required. Book today by calling 855-998-5359. Showtime at 11:45pm: Everyone with a valid season pass or lift ticket is welcome to participate. Parade starts at the top of Cheers at 11:45pm. To carry a torch you must be 16 years of age and you must sign up at the Snowsports Desk on 12/31 (parent signature required if you are under 18). Call ext. 2000. Midnight: Free, everyone is welcome! Sitters are limited, reservations required. Book early, call 888-968-7686 ext. 7000.